Now it's time to learn the minor scales and key signatures. But, we've got a slightly awkward problem -- I'm currently in the process of revamping my printouts on this stuff, and we've got to switch over to an older printout that covers all scales and key signatures. So, you'll see some material we've already covered in there, and the information you want for this lesson begins on page 6. Just as you did with major scales, you should learn both the intervallic shape of the scale and memorize the key signatures. In my opinion you don't want to memorize another pattern like major's WWHWWWH, but rather think about how minor is different from major (with a lowered third, sixth, and seventh scale degree.) Similarly, in learning your key signatures you have to learn about the concept of relative minor (and its opposite, relative major) - this is the way in which one major key and one minor key share each key signature. Don't worry, it's all detailed in the printout! One more detail that students learn is the three "versions" of the minor scale - the natural, harmonic and melodic minors. I'd caution you to not take these TOO seriously (they are an artificial distinction for the purpose of training, and real music basically smushes all three together into one key which is simply called "minor"), but you might as well learn and practice them a little bit. If you want some written practice I've got a worksheet for minor scales, and a bonus sheet that mixes major and minor. Perhaps at this point you are still focusing on your "easy" keys, the top part of the circle from three flats to three sharps. Go back and fill in the circle of fifths worksheets (treble clef, bass) with the relative minors, or try an all minor circle! Practice creating the circle from memory, playing these minor scales on your instrument, and writing them out from memory. 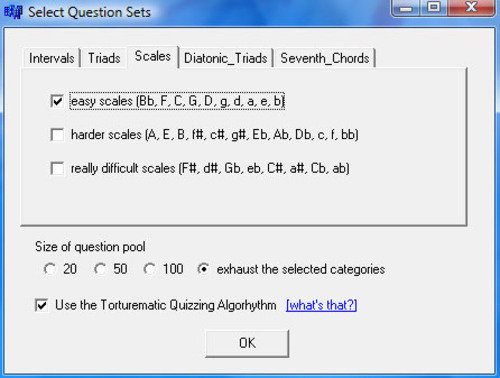 You could go back to Robert Whelan's scale quizzer (treble clef, bass) to practice your easy major and minor scales. (Remember that you have to monkey around with the settings to get only these scales.) His key signature quizzer will ask you about relative minors. when I made my quizzer I actually grouped the scales into three clumps, "easy" (from two flats to two sharps), "harder" (getting up to four flats or sharps) and "really difficult." Perhaps now's the time to master "easy" and "harder."